Usually in every hydraulic circuit whether it is basic or complex; hydraulic elbows are required to provide bend to the circuit. 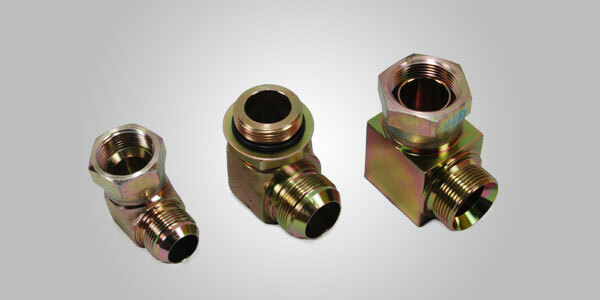 Hydraulic elbow is basically an elbow shaped bend which is usually having male to female or male to male threaded connectivity on both the ends to provide connectivity to the other joints. Available in various sizes, dimensions and angular bent these hydraulic elbows can be used for quick, easy and hassle free modifications in hydraulic equipment. We at Flexotech Products manufacture and offer a ready stock of a wide range of elbows available in various size; dimensions; angular bents and different connectivity options like male to male or male to female. Apart from this with vast experience in the industry we can also manufacture the elbows on demand as per the client’s specification and requirement. Our elbows are known for their high tensile strength unmatched quality which results in optimum performance of equipments after using the elbows and we ensure that the bent do not cause the loss of pressure in the hydraulic circuit of the machinery. Our unmatched quality; customer orientation and technical assistance makes us the preferred supplier among many in the industry of Hydraulic elbows.